Koster Finance is a financial services company that primarily operates in the non mortgage and mortgage loan brokers industry where it offers cash loans to individuals to help them meet their financial obligations which are urgent. 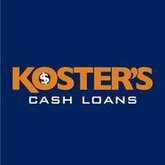 Koster Finance offers cash loans which have flexible schedules for payment and early pay- off discounts and without asking for any checking account. The loans are approved very quickly and this has made Koster Finance a leading financial services company serving more people than some of banks. Koster Finance also offers Western Union services. The company is based in Las Vegas, Nevada. There are currently 0 consumer reviews about Koster Finance available. Share your review. Please take a note that you are about to post a public review about Koster Finance corporate office on CorporateOffice.com. This review will be public, so please do not post any of your personal information on this website. If you would like to contact the corporate offices of Koster Finance, please use their contact information such as their phone number, website, and address listed above to contact them. However, sometimes staff from Koster Finance headquarters do read the reviews on this website.